During their visit to the United Arab Emirates (UAE), volunteers from HMS Argyll, a Type 23 ‘Duke’ class frigate deployed with Combined Maritime Forces in the Arabian Gulf, helped clear an overgrown graveyard containing the graves of fallen British military personnel. 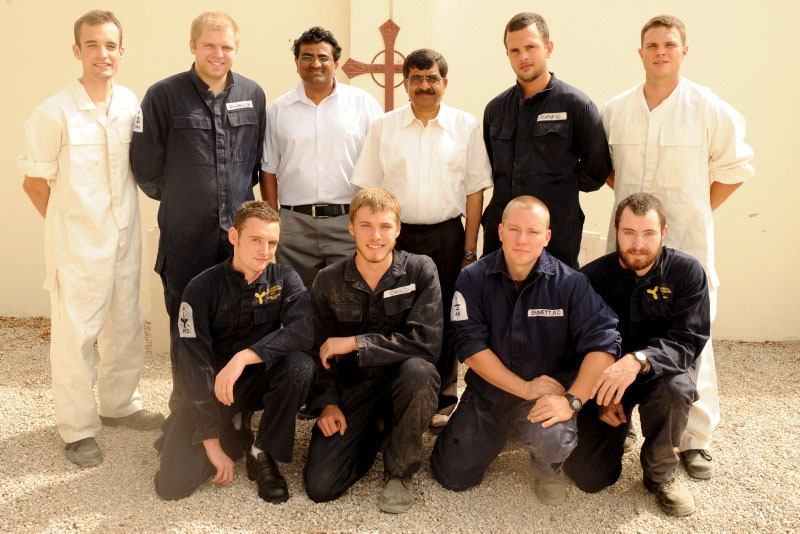 On Thursday 2nd February, 9 volunteers from HMS Argyll paid a visit to St Martin’s Church in Sharjah to preserve the memory of a group of British Trucial Oman Scouts. 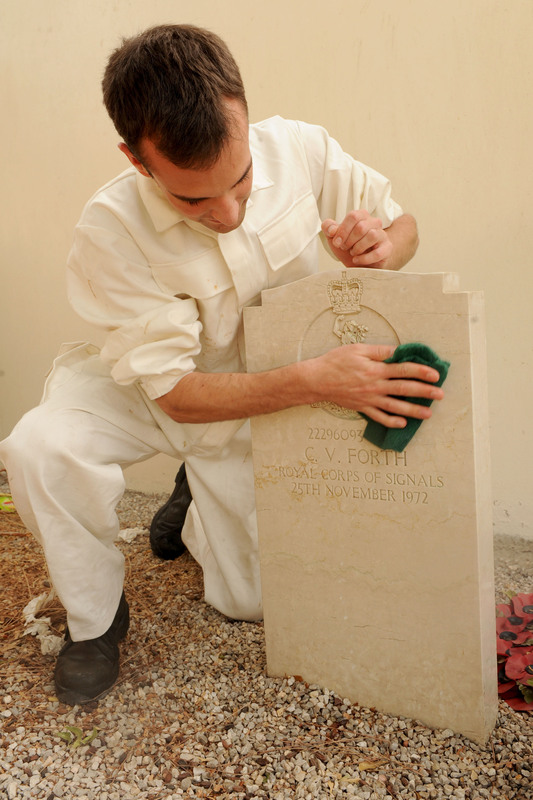 The graveyard required some rejuvenation in readiness for a televised remembrance service to pay tribute to the members of the British Armed Forces who lost their lives protecting the seven emirates of Trucial Oman, between 1951-1971. The seven emirates now form the countries of Oman and the United Arab Emirates. Last year was the 60th anniversary of the founding of the Trucial Oman Scouts (initially known as the Trucial Oman Levies) and their Emirati Officers would subsequently help define the new nation by helping to establish the civilian and military security institutions that would provide security to the new country and later combine to become the UAE Armed Forces and UAE Federal Police. The graveyard itself is in a small corner of the church’s grounds that needed some urgent care and attention with the area littered with overgrown bushes, rubbish and over hanging trees. The first task for the team was to clear the area of debris and rubbish before tackling the overly zealous tree growth. Not knowing entirely what they were going to face, the team brought an array of tools from the Ship but a warship is not equipped with the array of gardening tools readily at hand to a keen gardener in Britain. The wheel barrow, an essential tool in the average country garden, was needed and Chef Coathup, in the best traditions of the Service, adapted and overcome this limitation by transforming an abandoned shopping trolley into a makeshift wheel barrow. Once the area had been cleared, ET(ME)s Child, Shiell and Clark trimmed the trees to keep the branches above head height, so as not to obstruct the cameras during the service. The area was then levelled off and the grave stones were given a good scrub to ensure they are looking their best. Pastor Ernist Victor was extremely happy with the work and was surprised how much had been achieved in such a short space of time. ET2(ME) Child commented “There was an opportunity for us to volunteer to repair the war cemetery in Sharjah and I was keen to get involved. I hadn’t heard of the Trucial Oman Scouts but I have strong empathy for someone who has served abroad and in a cultural environment so different from our own. It was a good day and we felt like we had restored a little piece history in the memory of those who had made the ultimate sacrifice many miles from home”. HMS Argyll is in the middle of a six month deployment to the Middle East where she is currently operating as part of CTF 152, which is one of three Combined Maritime Forces (CMF) multi-national task forces. CMF is a 25 nation maritime force with its HQ in Bahrain. CMF nations are committed to working together in order to promote security and prosperity across 2.5 million square miles of international waters stretching from the Northern Arabian Gulf to the Suez Canal and the Somali Basin, which encompasses some of the world’s most important shipping lanes. Its main focus areas are defeating terrorism, preventing piracy, enhancing regional co-operation and promoting a safe maritime environment.